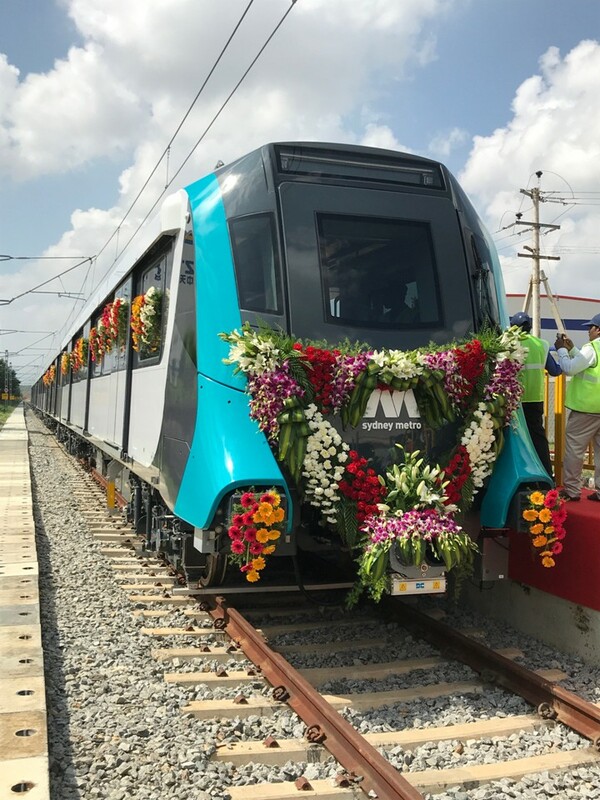 6 December 2018 – Alstom today achieved a significant milestone by completing the last of the 22 Metropolis trains for Sydney Metro, currently being delivered on schedule from its Alstom’s Sricity facility in Andhra Pradesh. The flag-off ceremony at Sricity took place in the presence of Ling Fang, Alstom Senior Vice President Asia Pacific, Alain Spohr, Managing Director India and South Asia, and Mark Coxon, Managing Director Australia and New Zealand. In 2014, Alstom won a contract to deliver 22 six-car trainsets, as well as the CBTC signalling system, for North West Rail Link, Australia’s biggest public transport project and first fully-automated metro network. Alstom’s engineering hub in Bengaluru adapted the Metropolis and Urbalis solutions to the specific needs of Sydney Metro to ensure fast, safe and reliable services to the residents of Sydney. “We are immensely proud to have completed the last train for Sydney Metro in this landmark project for the Asia Pacific region. We are also proud to see Sricity concluding its first export order on time, delivering on expectations and winning our customer’s trust. We firmly believe in India’s role as a manufacturing and engineering hub for international markets, and this milestone bear witness to that,” said Ling Fang. Alstom has established a strong presence in India. Currently, the company is executing metro projects in several Indian cities including Chennai, Kochi and Lucknow where it is supplying Rolling Stock manufactured out its state-of-the-art facility at SriCity in Andhra Pradesh. In the Mainline space, Alstom is executing Signaling & Power Supply Systems for the 343 Km. section on World Bank funded Eastern Dedicated Freight Corridor. Phase 1 in the construction of the new electric locomotive factory for manufacturing and supply of 800 units of high horse power locomotives is also complete at Madhepura in Bihar while the depot at Saharanpur in Uttar Pradesh is ready to commence operation. Alstom has set up an Engineering Centre of Excellence in Bangalore, and this coupled with a strong manufacturing base as well as localized supply chains, is uniquely positioned to serve customers across the globe. Today, Alstom in India employs close to 4000 people and in line with Government of India’s ‘Make in India’ policy initiative, Alstom has been investing heavily in the country in producing world class rolling stock, components, design, research and development to not only serve the domestic market, but also rest of the world.